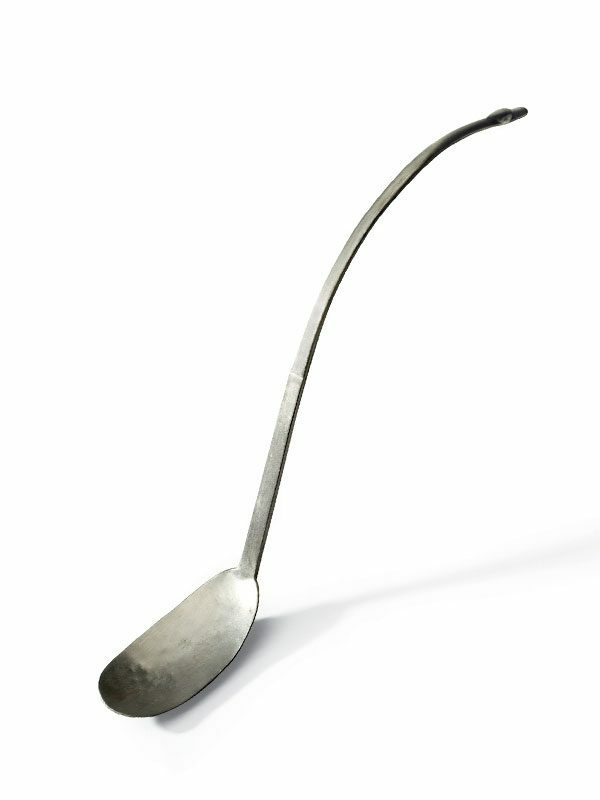 A silver spoon with a paddle-like bowl, a long curved handle and a raised section near the end, resembling a bird’s head in round relief. A small plum blossom is minutely engraved at the lower back of the handle. The remainder of the spoon is undecorated, showing a well-polished surface. According to Chajing (Tea Classic), the first monograph on tea in the world written by Chinese author Lu Yu in 758 AD, “one ‘ze’ of tea (a spoon of cha ze, ‘tea measure’) should be added to a litre of water, for a perfect blend.” A few undecorated silver spoons comparable in size and shape, bearing a two.character inscription ‘lishi’ at the back of their handles, were unearthed at Dingmaoqiao, Jiangsu province in 1982, and can be dated to the Tang dynasty, 760 AD. The inscription ‘lishi’, meaning ‘guardian man of strength’, is interpreted by some to be the deceased’s name or his official title. Therefore, the meaning of the plum blossom carved on the present spoon might be associated with the original owner’s personal information. Meanwhile, the blossoms of the plum tree are emblematic of perseverance and purity. The fact that only silver, no gold, pieces were excavated from Dingmaoqiao also proves that silverware was popular with people of medium social rank during the Tang period. Another Tang dynasty silver spoon with gilded decoration and its handle similarly ending in a bird’s head in round relief, was excavated in 1983 near Xian, Shaanxi province.